Heavy duty CNC machining is no problem for our Enshu. 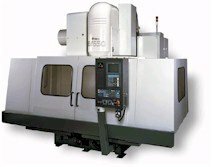 The Enshu 650 is a heavy frame, severe duty vertical machining center. Specially designed high torque CAT#50 taper spindle is more than a match for hardened tool steels. There are few machines in the world as capable as the 650.